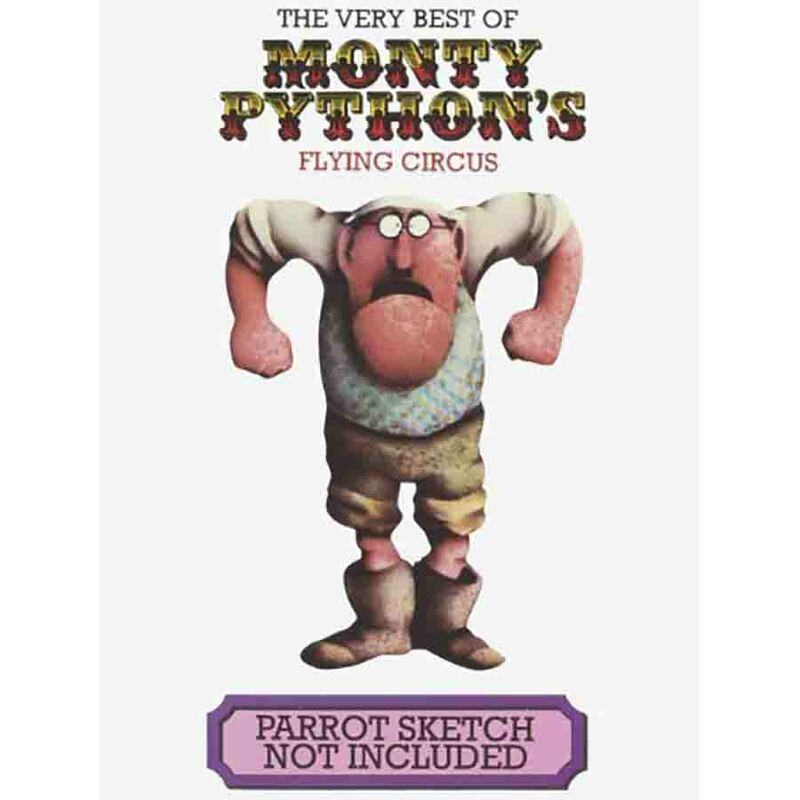 "Parrot Sketch Not Included - 20 Years of Monty Python"
Presented by Steve Martin, this anthology of some of the group's best bits from "Flying Circus" and "Fliegender Zirkus" (minus the eponymous Parrot Sketch), compiled by John Lloyd, marked the 20th anniversary of the original series' premiere. "Some people like them, I guess," espoused Martin in the intro. Among the clips (in whole or in part): William Tell; "Merchant of Venice" with cows (though it uses the German subtitles, so you have no idea they are actually reciting Shakespeare); Silly Olympics; Dennis Moore; How Not to Be Seen; the Exploding Blue Danube; World Forum; Greek-German Philosophers Football Match; RAF Banter; the Golden Age of Ballooning, with re-dubbed narration by Palin; French lecture on Flying Sheep; Conrad Poohs and His Dancing Teeth; Architects Sketch; Freemason; Minister of Silly Walks; Queen Victoria Handicap; Kitchen Sink Playwright; Fish Slapping Dance; A Man With a Stoat Through His Head; Vacuum Baby animation; Mrs. Niggerbaiter; Mosquito Hunters; Lovely Day animation; Sam Peckinpah's "Salad Days"; Stabbing Victim; Boot Camp Hospital; Come Back to My Place; Barber Sketch and "Lumberjack Sketch"; Dictating a letter; World War II film trailer; Spam; the Man With a Tape Recorder Up His Nose; the Mouse Organ; the Mouse Problem; the House Hunters; Competing Documentaries; Escape Artist Pianist; Argument Clinic; It's the Arts animation; the Spanish Inquisition; Tripping the Bus animation; the Visitors; Flying Harness; and Raymond Luxury Yacht. "Well, there you have it – the best of Monty Python," says Martin at the end. "Where are they now? "They're in this cupboard," he gestures, opening a closet to reveal the six Pythons crammed inside. "Sad, isn't it?" "Parrot Sketch Not Included" also did not include an original sketch filmed for the special with Martin and the six Pythons playing schoolboys. According to "The Pythons Autobiography," the comedy bit was shot but then cut, to Terry Jones' relief. "Somebody had cobbled this thing together," he said. "When I read it I thought, 'This is just terrible, we can’t do this.' … I'm very glad that they cut it." "The idea of getting Steve Martin and the Pythons together was a nice one," said Michael Palin, "in the sense that we respected each other, but it was not necessarily the easiest way of producing the best comedy. That's why I've always felt Python was at its best when it just was the group of us. It was quite a self-contained momentum. It couldn't be exported, it couldn’t be grafted on to anyone else nor could anyone else be grafted on to Python." The special marked the final TV appearance of Graham Chapman, who was suffering from throat cancer. "Suddenly Graham was carried in," said Eric Idle. "I think Steve had not seen him, nobody had bothered to warn Steve that he might be sick and he just looked at him. He was gaunt and being carried in, and what was good about it was everybody was there, everybody who ever worked for us in come capacity as working on it, and it was like a nostalgic last time to do this. We weren't very good, we weren't very funny, but it was a nice experience." "Of course when we shot on the day I don’t think we'd realized how ill he was," said Jones. "He had this frame in order to keep him upright, he had to wear this frame, so he was very, very ill at that stage. It was extraordinary he actually got on camera. That was when we knew he was not at all well." Chapman died on October 4, 1989, the day before "Parrot Sketch Not Included," was first aired.